Rustic floor lamps are a great way to light up a dark corner, or accent your lodge style home. LodgeCraft offers a wide selection of rustic floor lamps in the traditional downlight style as well as the ever popular torchiere uplight. We have offerings of the rustic, cabin, and western varieties, and exceptionally well made art glass floor lamps. Many of our floor lamps have coordinating table lamps, sconces and more. Not finding what you are looking for? 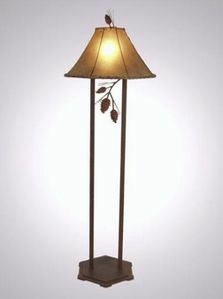 We have a wide collection of vendors that we don't display online, so we probably have what you are looking for if you are searching for a lodge floor lamp.